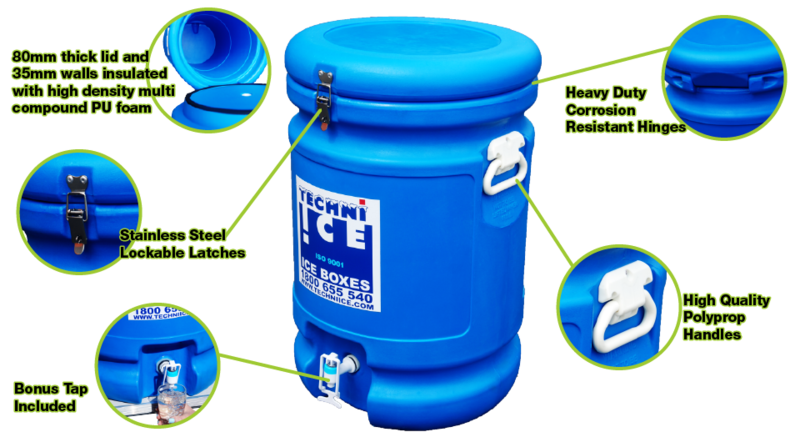 Techni Ice fully insulated drink dispensers come with a tap and bung. They actually double as a really good ice box as well. They are all food-grade and ideal for commercial use, and are used at the front of restaurants, cafes and events etc, so that people can have self-serve chilled water. You simply put the cup up and away you go. The seals on these products are typical of Techniice , they're very good seals, and they seal onto the corresponding lip on the base of the dispenser. Another feature of this product, are stainless steel latches. A padlock attaches to them so nobody can interfere with the contents. They're a great item. With recessed handles on the side, so when they're in a vehicle, nothing is sticking out, and the same with the dispenser fitting on the bottom as well. They come with a bung as well. The handles then fold out, so you can easily pick it up. They're also a great tub for if you want to have a party tub or for drinks etc. Because they're so well-insulated, these will keep cold drinks for days, and days, and days on end. They're an extremely well insulated dispenser. They're 35 litres capacity, and come in blue. These dispensers have various uses other than a drink dispenser, but certainly as a drink dispenser they tick all the boxes. Techni- ice drink dispensers, come with a Techni Ice lifetime guarantee. The quality is typical Techni Ice combining function and performance.